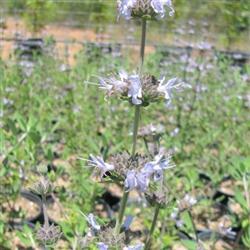 Salvia mellifera ‘Calamity Jane’ is a cross between our native Black Sage and Salvia leucophylla. It grows to form a compact, fragrant mound, reaching 3’ high and 4’ across. The flowers are more deeply colored than the Black Sage and are shown off beautifully against vibrant green foliage. This tough drought tolerant plant loves a dry, sunny slope and will not need summer water once it is established. Plant one and you will never be short of hummingbirds, bees and other pollinators.